In his interview with Brock and Salk on 710 ESPN yesterday, Mark Rodgers left Seahawks fans feeling pretty optimistic about the chances of him and the team striking a deal for Russell Wilson at some point. Brady Henderson and Bob Condotta both transcribed the interview, offering up key points such as (1) the sides feel no pressure to get a deal done, (2) Wilson would be fine playing out his rookie deal at $1.54 million in 2015, (3) the sides have had positive talks and made progress and (4) Wilson hopes to remain in Seattle for a long time. Not covered in those recitals of the interview were two related concerns regarding Rodgers and his inexperience in negotiating a major NFL contract. He’s a baseball guy, and there has been concern that he might not understand the intricacies of NFL deals. “To label me a baseball agent as though that might be a defect or a negative is inappropriate probably in this case,” he said. “I understand the collective-bargaining agreement and the marketplace and the salary cap and the issues that will be relevant to us moving forward in our conversations with the Seahawks. One big question has been how Rodgers would value the extension. Would he view only the new money or would he add the existing final year into the computation? The way John Schneider and Matt Thomas (Seattle’s contract guy) do deals, they almost always simply add the extension to the existing deal, with a signing bonus serving as the big extra payment in the coming season and the extension taking effect the next year. That comment jibes with reports that guaranteed money is the real sticking point in this negotiation. Ryan Tannehill’s deal (with $21.5 million guaranteed at signing) should help Rodgers a bit there, but there still would be a big gap between that amount and the $40 million fully guaranteed the top quarterbacks get and Rodgers surely would like for Wilson. Rodgers also pointed out that franchise QB deals are not meant to last. He pointed out that Tony Romo, Ben Roethlisberger, Tom Brady and Peyton Manning all have renegotiated their deals before they expired. “The truth of the matter is these contracts for quarterbacks typically never get to the end,” he said. As for the format of the deal, Rodgers said option bonuses, workout bonuses and other payment methods are being considered. The Seahawks typically do not do big option bonuses, but in this case they should consider one. It would give Wilson the guarantees he wants and keep his cap hits reasonable. Asked about Schneider’s comments that he wants to work “outside the box” and not mimic other QB deals, Rodgers said he understood Schneider’s stance and the way he wants to put together his team — although Rodgers did not say he agreed with the approach in Wilson’s case. Clearly, No. 1 defense in the league and a smashmouth, wear-you-out running game have helped Wilson. And there certainly are a number of quarterbacks who could have done what he has with those supporting (or leading) elements in place. 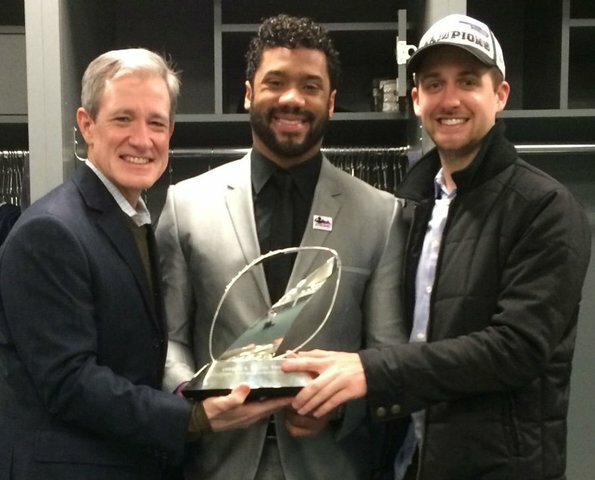 The Seahawks surely know that, but they probably have not said that because they appreciate the unique qualities Wilson does add to the team. Rodgers said neither side is trying to find leverage against the other in these talks, so there appears no danger of them becoming overly contentious.